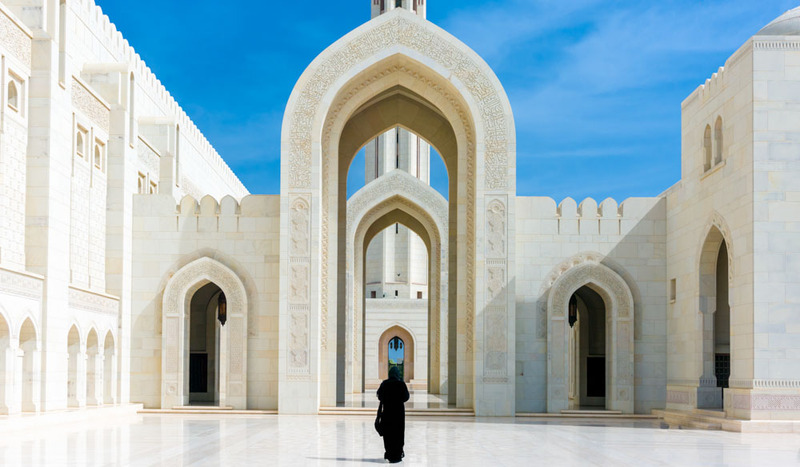 The magnificent sultan Qaboos Grand Mosque, Muscat (photo: Leigh-Ann Pow). The opulent Al Zawawi mosque in Muscat (photo: Leigh-Ann Pow). Muscat's old town (photo: Leigh-Ann Pow). The otherworldly Al Hajar Mountains (photo: Leigh-Ann Pow). 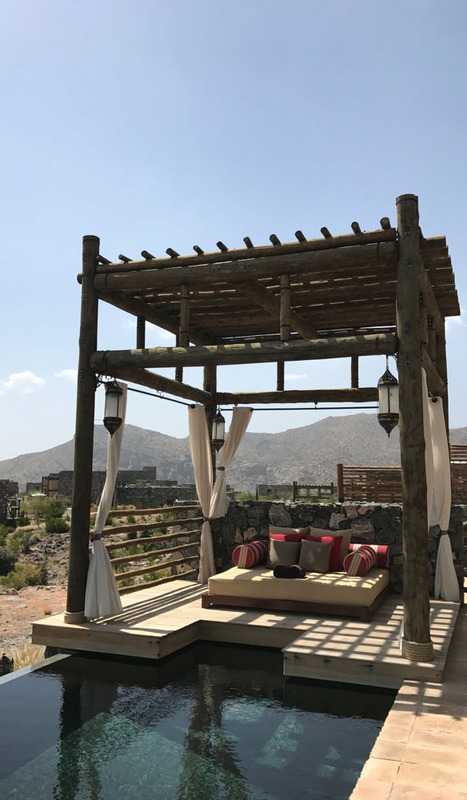 A quiet spot at Alila Jabal Akhdar in the Al Hajar Mountains (photo: Leigh-Ann Pow). A view of the mountains from Nizwa Fort (photo: Leigh-Ann Pow). 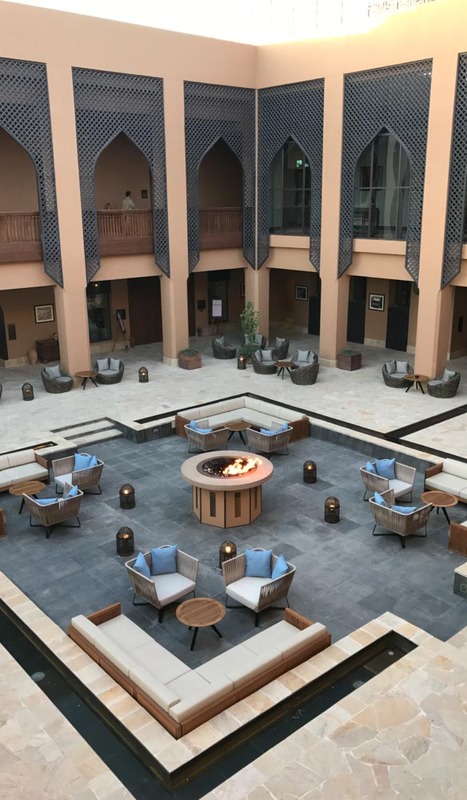 An expensive courtyard at the grand Anantara Al Jabal Al Akhdar (photo: Leigh-Ann Pow). 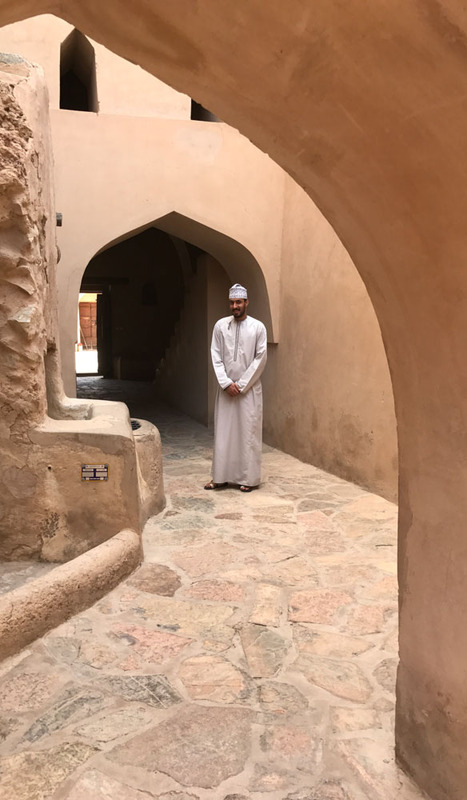 A smiling guide at Nizwa Fort (photo: Leigh-Ann Pow). The car swings around yet another hair-pin bend and the world drops away on one side revealing a deep chasm in the Earth’s surface. I am torn between squeezing my eyes shut to allay the squeamishness I am feeling about the perilous height, and pressing my nose up against the glass of the car door to get a better look. We have been climbing and switching back on ourselves and navigating whiplash-inducing hairpin bends for some time now, my knuckles turning whiter with each burst of the accelerator. Given our intended destination is some 2000 metres above sea level, it’s probably not surprising that the journey takes a while. I know it’s just my imagination (and the fact that I am constantly looking up so that I don’t have to see how far down it is), but I feel like I could actually touch the sky if I stretched enough. As the road levels out momentarily, I get ridiculously excited as a family of mountain goats – the mother purposefully leading the way trailed by her kids – trot along in search of something to graze on in the coarse, scrubby vegetation that fights to thrive in the rocky earth here. And then the world drops away again as we start to climb, inching ever closer to ‘heaven’. I am in Oman, a wide, diverse country of just 4.42 million inhabitants, located in the Arabian Peninsula, and bordered by Saudi Arabia, Yemen, the United Arab Emirates and a large swath of Arabian Sea coastline. 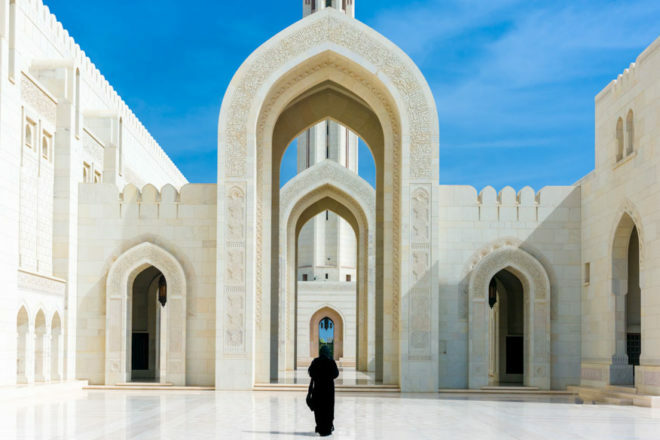 While most people’s perception of the countries of the ‘Middle East’ (this term is not widely used here) has been shaped by the unrelenting bling of Dubai and a lifetime of news stories, Oman is not like most countries in this region. With a fascinating history influenced by its Bedouin traditions, seafaring and trade – the wildly exotic port of Zanzibar in East Africa was once controlled by Oman, as it shipped aromatic frankincense and exotic spices to the new world – this is a generously welcoming county whose proud people are humble and warm. Omanis also pride themselves on their tolerance, especially when it comes to religion. The majority of the population here practise a form of Islam known as Ibadi, which is characterised as being ultra-moderate and inclusive, open to differing views and opinions. 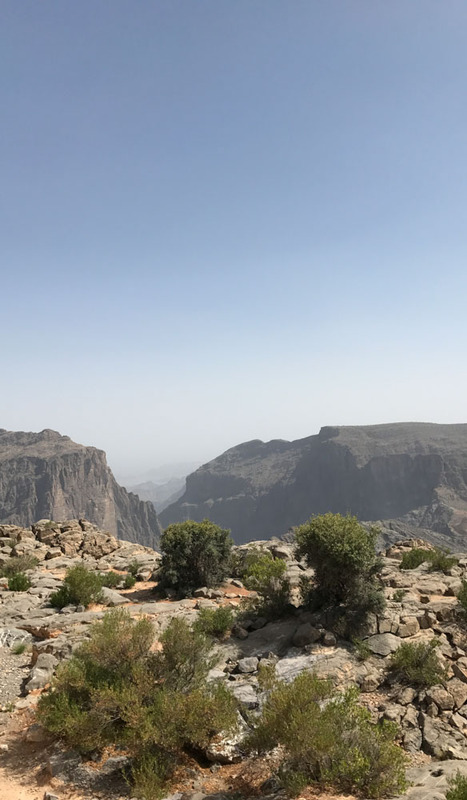 According to our guide Kamil (the very competent driver behind the wheel of our mountain road odyssey), no one in Oman even thinks to ask about anyone else’s religion because it doesn’t matter; he explains that he only discovered his neighbour was Sunni after knowing him for years. Back on the road, our journey into the Al Hajar Mountains finally reaches its conclusion at Al Jabal Al Akhdar. Stepping out of the car, my heart skips a beat as I look out across an otherwordly landscape of jutting peaks bathed in clear-skied sunshine. My silent musings about ending up in heaven have come to fruition. With the scorching summer heat exquisitely tempered by the dizzying height and gentle breezes, I can see why these mountains are a favoured getaway of locals and expats come the summer months. Known as the Green Mountain, the vista stretching out from where we stand is dotted with low greenery. Each year the area provides a plentiful harvest of exotic produce: in March and April it is rose petals to produce the prized local rose water (one of my favourite local customs is that of having your hands sprinkled with rose water at the end of a meal); in May the apricot harvest begins followed throughout summer with peaches, figs, pears, almonds and apples; pomegranates, grapes, walnuts and olives follow during the autumn months. As we check in at the divine Alila Jabal Akhdar, we are greeted with plump dates and Omani coffee, another local custom I have quickly grown to love. The fort-like design allows the property to sit sympathetically in its surroundings and does nothing to obscure the view, or pierce the blissful silence that fills my ears. Within, the interior is understated and chic, decorated with local pottery and dominated on the inside by a huge open fire that is lit at night to warm the cool mountain air, and outside by a cliff-top pool that defines the word ‘infinity’. The next day Kamil ferries us back down the mountain (and past more mountain goats) as we strike out for Nizwa, an easily achievable day trip. Entering the town it is impossible not to be impressed by the hulking fort that dominates the low skyline. Built in the 17th century by Sultan Bin Saif Al Ya’Aruba, Nizwa Fort makes for an evocative exploration, as we climb narrow internal staircases and push past heavy wooden doors intricately decorated with metal studs. At the top of the fort, the still coolness of the interior gives way to a rush of desert heat, but the view out through the ramparts to the town below, with its flat-roofed dwellings and lush patches of date palms, is worth the discomfort. Back at ground level we head into the famed souq, and another welcome respite from the heat. The narrow lanes here are bordered by merchants selling spices, dried grains, woven mats, pottery and the silver that the market is famous for. I find a shop selling all manner of antiques and bric-a-brac, picking my way gingerly through a pile of old brass plates and candlesticks that have been warmed to scolding by the midday heat. Arriving back in Al Jabal Al Akhdar, we make our way to the grand Anantara Al Jabal Al Akhdar. Resplendent in the same gentle rosy orange of Nizwa Fort, the luxe property is spread across the Saiq Plateau, looking out to the same vista of mountains that I have been admiring for a few days now, but which still manages to amaze and mesmerise me anew every time I catch sight of it. The next morning I eat a breakfast of hummus and labneh while surveying the resort before heading out with one of its guides to walk to local villages nearby: Al Aqr, Al Ayn and Ash Shirayjah. 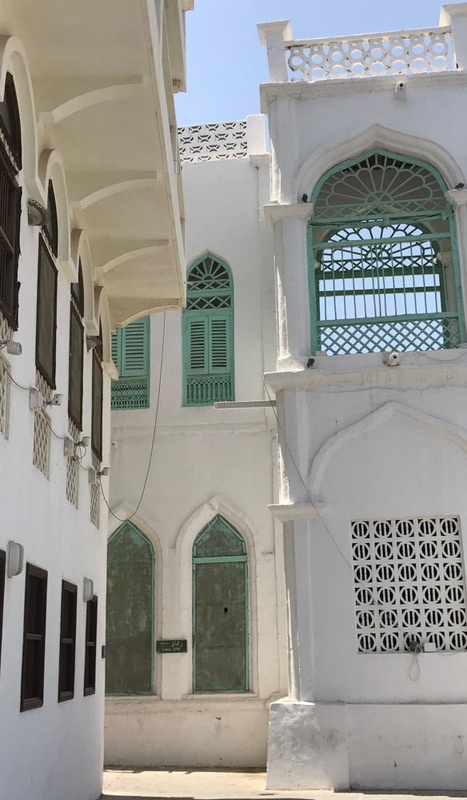 Passing evocatively abandoned houses and tightrope walking along the ancient irrigation system or falaj, we are given a potted history of the area. We pass a few local children playing in shady narrow lanes, but apart from that the villages are quiet. Making our way down the mountain (again) I actually savour the journey this time, knowing I will not be returning. Once back on flat ground we drive through a landscape of sand and rubble, before hitting the outskirts of Muscat. This was the starting off point of my visit to Oman a few days earlier. The capital of the country, the delightfully low-rise city has a wonderfully unaffected appeal about it; there are no skyscrapers or showy neon signs here, but that is not to say that the city doesn’t possess presence. Driving the wide roads, the skyline is dominated by any number of domes and minarets, vividly coloured with tiles of gold, blue and green, and giant portraits of Qaboos bin Said al Said, the much loved Sultan. 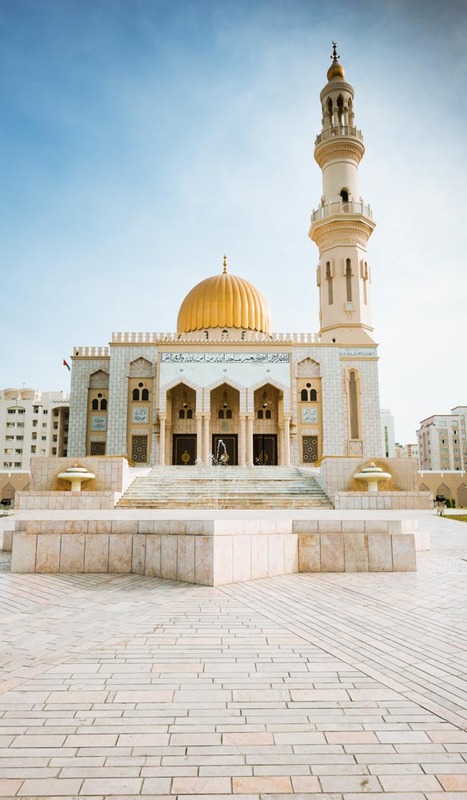 The most imposing of all the mosques is the Sultan Qaboos Grand Mosque. Completed in 2002, the complex is a beautiful vision in marble with the second largest hand-loomed carpet in the world in the main prayer hall. I visited the old town, where the pretty white-washed buildings with their ornate windows and heavy metal doors face out to sea. Here the higgledy-piggledy alleys of the Mutrah Souq sucked me in as I browsed shops groaning with vintage Bedouin silver pieces, including rings with stones the size of gobstoppers and intricately decorated khanjar, the traditional Omani ceremonial dagger. But, sadly, I am not stopping this time. I have journeyed to heaven and back in Oman and now it is time to head home and back down to earth. Getting there: Etihad has daily flights to Abu Dhabi from Sydney, Melbourne, Brisbane, Adelaide and Perth, with flights daily from Abu Dhabi to Muscat, Oman. You are spoilt for choice in Oman when it comes to luxurious hotels with a real sense of place. – In Muscat: Shangri-La Barr Al Jissah Resort & Spa sits on a sweeping beach on the shores of the Sea of Oman, nestled between jutting mountains that are shaded a rich pink at sunset. – In Al Jabal Al Akhdar: Perched high in the Al Hajar Mountains, the generous rooms at Anantara Al Jabal Al Akhdar Resort look out to awe-inspiring views, and the luxe inclusions include an Anantara Spa and myriad dining options. – Alila Jabal Akhdar’s low-slung beauty and luxurious approach allow it to sit unobtrusively in the stunning surrounds of the Al Haj Mountains. What's it like to live in Oman?